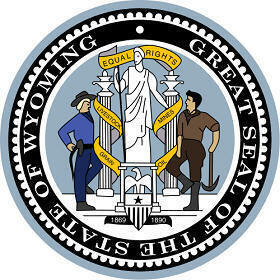 The Wyoming state seal identifies government buildings and officials and is a centerpiece for the Wyoming state flag. 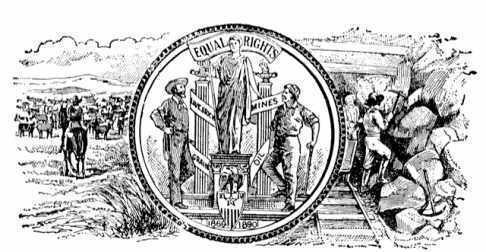 The symbolism, history and emblems of the Wyoming seal are described in this article with fast facts and information. Fact 2: The two dates, 1869 and 1890, commemorate the organization of the Territorial government and Wyoming's admission into the Union. 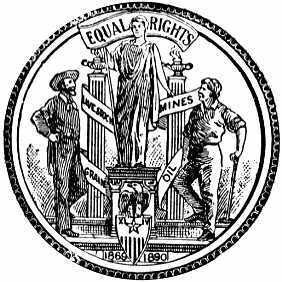 The central female figure features the Greek Goddess Nike, the spirit of victory, holding a banner containing the Wyoming state motto, bearing the words, "Equal Rights,"
The Wyoming motto reflects the deep conviction of all Americans adhering to the principles of equality regardless of gender, color or creed. Nike is framed by two pillars. One bears the words "Livestock" and "Grain" representing the agriculture industry. The other bears the words "Mines" and "Oil" representing the mining industry in Wyoming. On top of the pillars rest lamps from which burn the Light of Knowledge. The two male figures wear the clothes and bear the tools that typify the livestock and mining industries of the state. 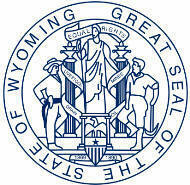 The Wyoming seal is kept and used as required by the Constitution and laws of the state.